Quiet, sea breezes blowing, warm sun and the sand. Think again. This is the world of Crimson Skies. My Take on the Crimson Skies universe. (Quick Guide. Blue signals a new continent. Red is a nation/location on that continent. Black Underlined signifies a working link). South America. A big blob of land SOUTH of Mexico. Peru. A independant Sout American nation, Peru recently experianced a Nationalist coup and is becoming friendly with Germany, especially the private Eiserne Fäuste-Industrien (Roughly, Iron Fist Industries) which has bought lucrative mining contracts within that nation. Caribbean. Once again, after 200 years, a massive breeding ground for pirates, exceeding the density of pirates even in the Hell's Height's region. The hundreds of small islands, and dozens of differant powers, allows pirates to not only thrive, but prosper. Cuba. An island in turmoil. Currently occupied by Republican Spaniards, and being fought over with Nationalist Spaniards and German assistants. Europe. Although North America is in constant turmoil, bigger problems reside in Europe. Antagonism started in North America, smolders under the surface here. The pressure is slowly building as the world waits for a blow-off. Swedland Confederation. The united nations of Finland and Sweden for a common defence against a reinvigorated USSR. 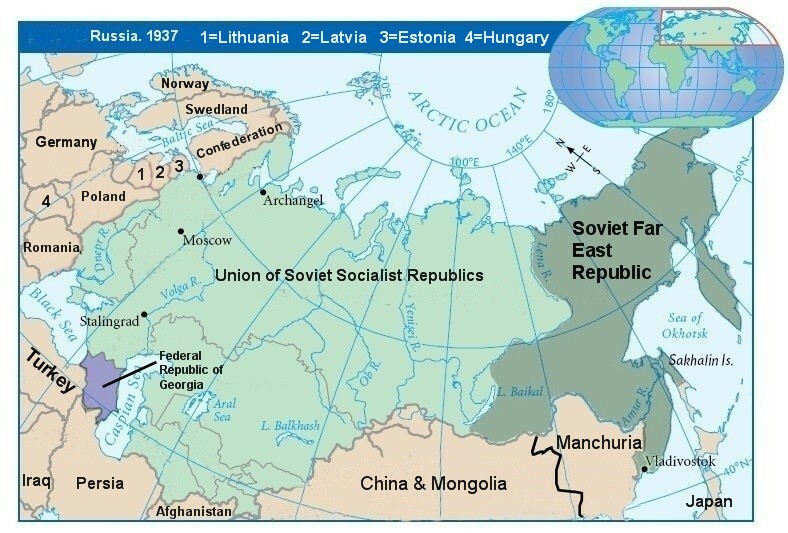 Union of Soviet Socialist Republics. Also known as the USSR, it is a communist based government. Currently rebuilding it's power first lost in the civil war. Federal Republic of Georgia. A White Russian government, based on the Caucasus peninsula. Africa. A vast open area, many forget Africa in the new age of North America. However colonial powers still jockey for position and encourage raiding of the other nations. Not to mention the pirate units that base out of the western coast of Africa. Asia. With a dozen differant players here, not to mention the pirates and mini-warlords, it is no surprise that Asia is a powderkeg equal to that of North America and Europe. Add in a rapidly expanding, militaristic Japan, and you got dynamite. Australia. A continent currently embroiled in a bloody, drawn out civil war, with both sides willing to fight to the death to win. Commonwealth of Australia The original nation on the continent, it is currently fighting to re-absorb the Western Republic of Australia in a bloody civil war. Republic of Western Australia. The Revolutionary government formed in Perth, and fighting Commonwealth aggression tooth and nail to stay free from the British puppet. The Marivellas. A fictional Island chain located between the Solomons and the Marshal Islands. Taken from the TV series, "Tales of the Gold Monkey". The Islands are home to both Khan Industries and the Koji Empire.